PLEASE NOTE: some aspects of these guidelines are under review. All the information contained is still useful and applicable, but we may expand or change content according to new safety requirements. We’ll let you know in due course of any changes. 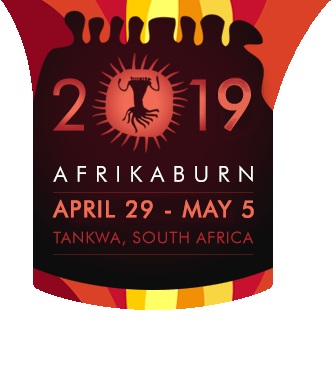 AfrikaBurn’s a freedom of expression and creative arts event that’s a Temporary Autonomous Zone (TAZ), but when it comes to fire safety, there are some default world requirements that call for diligence and common sense. These aren’t designed to bog down artists and creators, but to make our burn as safe as possible for everyone concerned. The Players in this Fire Art shindig. Rangers: those magnificent people who walk Tankwa Town to help us with all they can. FAST: (our Fire Art & Safety Team) A mixed bag of crew that are working or volunteering to assist and try to make the burn as safe as possible. This team is a mix of engineers, fire technicians, the creative portfolio and Rangers. Know anyone who should be on this crew? Let us know, thanks! Safety Officer at AfrikaBurn: It is a requirement of SA event regulations to have a registered Safety Officer and crew on site to ensure that all legal requirements pertaining to health and safety on site are met. South African law: Yes, we’re a Temporary Autonomous Zone, but it takes place in the Republic of South Africa, and when it comes to safety, this means we have to adhere to the Health and Safety at Events Act. MOOP/LNT team: they will advise on clean up and sign your site off as cleared. This will reflect on the MOOP map. Find out more here about LNT for Artworks. It’s important to remember that all of the above make up the team who work together to safely satisfy your lust for flame. If you’re planning on building a large artwork, it’s important to consider that the citizens of Tankwa Town are likely to push the boundaries of interacting with your piece. As such, the structural integrity of the piece is paramount. Depending on the scope of the work, we can either utilise the services of our volunteer engineers or you might be required to have the structure signed off at your expense. You’ll need to communicate with the Art team on this during the development of your piece. When planning an artwork that you intend to burn, you’re not only making an artwork but building a (large) fire, so it’s important to choose the materials you use carefully. As a rule of thumb, untreated raw wood is always better to burn than ones that contain glues, such as plywood, Masonite, MDF, Supawood and chipboard. Consider how these materials burn: cardboard, thin sheets of plywood or veneer under 6mm thick, chipboard and cloth can create sheets of embers blowing great distances, showering sparks down on people, tents and vehicles. Not good: we don’t want that under any circumstances. Bamboo is a great construction material but be aware that the cells are sealed chambers filled with air, which cause small ‘explosions’ when burning. Bamboo is clean environmentally, but need to be considered when managing and setting up your fire perimeter. Laminated wood is often treated with fire retardants. These retardants can greatly affect the burn time and end with support pieces remaining upright long after the bulk of the piece burns away. If there is laminated wood that contains glues in your structure, understand that a higher speed burn releases less noxious fumes than a slow burn. Heavily painted or treated wood, plastics and other inorganic materials can cause excessive fumes and won’t be allowed to burn. Do not use them. Paint: utilise water based paints, food dye, natural stains. Wires and Cables: Where possible, avoid the use of wire stays and support cables as these are a hazard to the public after the structure has dropped and the perimeter has been collapsed. People moving between and around the collapsed artwork in low-light conditions are not able to see the wires/cables and the risk of them tripping and falling into burning coals is a very real possibility. As a creator of a piece that’s going to burn at the event the actual burning of the artwork is obviously part of the work. It’s a heady and exciting thing to do, so planning is important. You’re responsible for all aspects of this and must work in conjunction with our fire & art teams. It’s compulsory to attend one Burn Briefing before you burn your piece. They happen at 2:00 PM everyday from Thursday to Sunday. Please enquire at the Arteria for more details (you should come check in anyway, when you arrive on site). As the surface of our desert floor is hard and rocky, it would be more disruptive for us to grade the surface layer of desert floor to insert a burn shield. The Tankwa floor is very resilient in that it recovers remarkably well after a season of weather. Our approach has been to minimise burn scars by placing artworks that are intended to burn on sites that have had a prior burn. You can help us minimise new burn sites by not burning your piece on a virgin piece of Tankwa floor. Your artwork doesn’t have to burn on the site that it was built – you can use an existing burn site. Please be aware that you’ll still have to remove all your burn debris. And it’s important to be considerate to other artists: if they’ve already cleaned their burn site, make sure you leave it as clean as they did. Please come to Arteria to make arrangements. You’ll be required to attend one of the burn meetings at the burn. These are scheduled for 2pm on Thursday, Friday and Saturday of the event at the Off-Centre Camp briefing tent. Designate one person from your team to be the Fire Safety Perimeter Manager for your project. This person (who can be the artist his/herself, if necessary) will be the point of contact for the FAST and Rangers. Cool Head – ability to stay calm in the middle of chaos. Good Organisational Skills – ability to coordinate and manage the perimeter crew and herd cats. Communication and People Skills – ability to communicate clearly at all levels, and communicate face-to-face instructions to perimeter team. Understanding The Big Picture – ability to set up in advance and manage the chain of command, the timeline for the perimeter set up, performance, and the rendezvous point for perimeter team, ensuring everybody knows exactly where he or she should be, what to expect, what to do, and who’s in charge. In preparation for a burn, the artist and a representative of FAST must clearly identify and set up the Burn Zones. The diagram below is an example of a 21m-radius perimeter. Artwork – The artwork is at the center; this is the area where the burn itself will take place. Just beyond the artwork is the Fire Zone, where the structure may fall. No participants are allowed in this area. Perimeter Dividing Line – This is the line that separates the audience from the Safety Perimeter Crew and is just inside which the Perimeter crew is stationed. Audience Viewing Zone – This is the area where the audience is located. This is calculated as a function of radius from the center of the artwork/structure to be burned, and it is determined for 2018 to be 3 times the height of the structure. The size of your artwork, the materials used for its construction, the type fuels and fuel load needed and if you plan on using pyrotechnics are all factors that will go into determining the perimeter needed for your piece. The size of your burn perimeter will be ascertained by FAST at the Burn Briefing the day before your piece is scheduled to burn – it’s mandatory that you are at this Burn Briefing. Larger burns require that you plan for placement of fire/emergency lanes and entrances for emergency and fire service vehicles. To identify and divide quadrants, and create Safety Corridors, AfrikaBurn uses clock face designations. Normally the Safety Corridors would be placed at the 3ish & 9-ish positions (see diagram above). FAST will help you with this planning. We recommend a maximum distance of 4.5 meters between Outer Perimeter Fire Marshals. Make sure your Perimeter crew can be easily identified and distinguished from participants by the use of Hi-Viz (dayglow) safety vests to be worn over their jackets or other outerwear. If you have the bandwidth, creating artwork(s) specific vests is a very nice keepsake/gift for those that assist with your perimeter. For larger burns, divide the burn circle into four quadrants and number or name each one. Designate one person to take responsibility for each quadrant. Make sure everyone knows the name or number of his/her quadrant. This will make the task of locating emergencies or other issues easier for all involved. Clear communication at all levels is essential. We’ve found that radio communication is great help for all burns and is a requirement for larger burns. In the event of a perimeter collapse, make sure all perimeter crew know not to put themselves between a surging crowd and a fire. All crew should go to the designated rendezvous point so that everyone can be accounted for. All artists must create a timeline and/or scenario for their burn. This will allow FAST to coordinate with other artists’ burn scenarios before and during the event. Outline the burn from start to finish, including establishment of the perimeter, the loading of any pyrotechnics, any pre-show performance, fueling details, ignition of the art, any structural collapses, and ending with the release of the perimeter. Fueling details should include types of fuel used, how the fuel will be placed and in what quantities. We’ll need to understand who will stay with the piece overnight to ensure the piece is completely out and no longer a danger to participants. We’ll also need the details of your cleanup plan, including who will lead that effort. For smaller and less complex burns it’s possible that a perimeter can be set with a small staff and without the need for a marked barrier. Larger burns will need to plan for a marked perimeter and secure supplies such as markers, blinky lights, or caution tape (your last resource) to define your perimeter before the burn. Regardless of burn size you will also need a number of appropriate and fully charged fire extinguishers to deal with any premature ignition or unintended fires. An advance plan will need to be in place to cover any weather conditions that could halt the show after fueling has taken place or pyrotechnics materials have been installed. This will require an all-night standby. Artists must be proactive and prepared for protecting their artwork from being disturbed once it’s loaded with fuel or staged with pyrotechnics to avoid any unintended burning or participant injury. Registering your artwork by filling out the art questionnaire will help to create Fire Art safely. Communication between the Creative Crews and the Art Wranglers and FAST is very important to get this right. The earlier you start your discussions, the better the FAST team can assist you. Once you’ve arrived in Tankwa Town, you’ll need to check in at the ARTeria. This communicates that you are ready for a face-to-face dialogue with FAST and to be escorted to your art location on Binnekring. We will also need to know where in Tankwa Town you are living in the case that we need to find you, so come prepared with that information. Most perimeters should be set at least two hours before the performance/burn. This timing is dependent on the project’s size, intensity and the complexity of your pre-burn activities. Pyrotechnic performances should have a perimeter established before the pyrotechnic load-in begins and the perimeter must remain in place until after the site has been declared safe. This initial pyrotechnic perimeter can be a smaller perimeter depending on the size of the structure, quantity and type of pyrotechnic material being used. A member of FAST who is certified for pyrotechnics will discuss this with you prior to your chosen burn day. A sufficient supply of fire extinguishers should be on hand from the beginning of the perimeter set up and must be visible and accessible at all times. Form a tight ring of teammates arm-to-arm around the immediate performance area. Together as a group, proceed at a slow pace outward towards the eventual perimeter to ensure that foreign objects and non-crew participants are not within the perimeter. Be assertive, but polite. You are the host, they are the guests. This is your gift. Once the perimeter has been set, your perimeter team must be diligent in keeping audience members out. Remember, the perimeter is there for their safety. Sitting is not recommended for the perimeter crew, as it is too difficult to spring into action from this position. Squatting, or crouching with one knee down is better. All members of the perimeter crew should have a flashlight or headlamp for visibility and safety. Additional team members may be needed to stand back from the front line of the perimeter crew to catch anyone who makes it through the perimeter line (this does happen). Before the performance, this second line can stand in for perimeter crew members when they need a bathroom break. Also, have some food and water available for your crew, and encourage them to bring warmer clothing to wear under their safety vest for a cooler evening. Working with your audience is very effective and good humor is essential. Make friends with the audience; it’s crucial that they assist you. Perimeter crews always face the crowd, with your back to the art piece. If you do not set up a perimeter before the audience arrives, it’s really difficult to get them to move back. Also, do not be too concerned if the crowd yells things like “burn it!” The crowd can sound surly, but they are at your burn to see the show and have a good time. Be patient and sensible. event. Please ensure that you crew are sober. fuel your piece and complete your preparations to burn. Just before the burn, a FAST member will check the weather. Barring any high wind conditions or other negative weather factors you will receive an OK to burn from the FAST member. For simple burns not involving pyrotechnics or large amounts of liquid fuels, the decision on when to drop the perimeter is based on when the highest pieces of the artwork has fallen. The idea is that a hazardous situation exists until any components of the artwork over 2m tall that may conceivably fall, have actually fallen. For larger burns, FAST will help you to make this decision. For projects involving pyrotechnics, and not scheduled to burn completely, the pyrotechnics crew must make a sweep of the area for unfired pyrotechnics materials before the perimeter can be dropped at FAST’s direction. FAST will NOT allow a pyrotechnics crew member to enter a burning structure to check that the pyrotechnics have gone off. Once the perimeter has been dropped, it’s important to make sure that any unburned wood or other materials that have fallen outside of the burn area are thrown back into the burn. It is important that these items do not become a tripping hazard for participants approaching the fire. If there are rebar, ground screws/ground anchors or stakes protruding above the desert floor, cones will be needed to be placed over them to alert participants. Tree poppers are available at the Arteria. Once the perimeter has been released an overnight crew will stay with the embers to ensure participant safety and to prepare the area for clean up (LNT) in the morning. Do not allow participants to throw items that are not to be burned, like plastics or hazardous materials, into the fire. Braaing marshmallows is completely acceptable. If your burn plan goes like clockwork, great! But remember: in Tankwa Town you must be flexible and patient to have a successful burn. Having a backup plan (or two) is essential. One major factor to take into account is weather; the start of the burn performance may need to be placed on hold or cancelled and rescheduled for a different night. Know where the fire extinguishers are. All perimeter crew must be trained in the use of and aware of the location of the extinguisher closest to them. Have the Safety Perimeter Crew ready to respond at a moment’s notice. They should have eyes on the crowd. In the event of a perimeter collapse, make sure all perimeter staff knows not to put themselves between a surging crowd and a fire. Rendezvous Plan – After the perimeter has dropped, all crew should go to the designated rendezvous point so that everyone can be accounted for. If possible, try to make sure the area outside the crowd is clear. In the event of a collapse, the surging crowd may respond by turning around and running back away from the fire. Please make sure you hand back you fire bibs AND RADIOS to the FAST team. The artist should be ready to stand by the art if the weather turns bad. A FAST member will be assigned to each burn and will be able to confirm your ignition timing. The FAST member will be the final word on wind and perimeter before the project can be lit. Completely cleaning the site of your burn is essential for the continuation of our event and it is your responsibility as the artist. Magnet sweepers and Tree Poppers will be available on loan from the Arteria to pick up metals and take out rebar. ALL debris must be cleaned from the site – including leftover coal from the burned wood. Once the burn site has been cleaned the artist should return to the ARTeria to have an authorised MOOP team member return with them to the site of the burn. Only after this last review of your burn site will you be considered checked out and able to leave the site. Please note that not cleaning your site will affect funding applications in the future. In order to always improve what we do we need to hear from you about your experiences with your burn. Please send in any feedback that you have to [email protected]. When we say “Fire performer” we’re talking about any person who uses fire props as a medium of dance, and expression. They can be amateur, or professional. These guidelines are intended to reduce the risk to both the performer, and any audience members. Fire performers assume all risk of this activity – AfrikaBurn doesn’t accept liability for this activity. All performers must be at least 6m away from any structure. It will be the responsibility of the performer to complete a visual site inspection. It’s the responsibility of the performer to provide basic safety equipment – at least a wet towel or fire blanket. If you don’t have this basic safety equipment, you’ll be asked to stop spinning until you provide the equipment. Performers must be sober throughout the use of fire props, and must not spin alone. Performers must have a safety spotter throughout the burn time for their prop. Only paraffin, benzine, or lamp oil may be used to fuel wicks. Petrol / diesel must never be used. Only all natural fabrics are to be worn, whether spinning, or spotting. Polyester, rayon, fun fur, or any other synthetic fabric will melt when set alight. Loose fitting, or flappy clothing such as sarongs are also not acceptable. Cotton, denim, or leather (not pleather) are acceptable fabrics. The majority of Flame Effects at AfrikaBurn utilise Liquefied Petroleum Gas (LPG). Most of the guidelines below deal with LPG as a fuel. Regardless of fuel type or technological basis, all Flame Effects must be constructed in such a way as to meet or exceed applicable laws, codes, and industry standards. All fuel supply pipe, tubing, hoses and fittings shall be rated for the type of fuel being used and the maximum operating pressure of the effect AS PER SANS 10087 – THE HANDLING, STORAGE, ETC. OF LPG. Accumulator tanks for use with flammable or liquefied gas shall be designed, manufactured, and tested in accordance with the national standard which govern this. If the gas supply pressure exceeds the maximum allowable operating pressure (MAOP) of the accumulator, a regulator must be installed between the fuel supply and the accumulator to reduce the pressure below the accumulator’s MAOP. A pressure relief valve shall also be installed in the accumulator with a start-to-leak setting at or below the MAOP and a rate of discharge that exceeds the flow rate of the supply container. Flame Effects must never be left unattended. The winds in the desert are highly variable, and may create havoc in a poorly monitored installation, including fires or explosions. Any Flame Effect found running unattended will be shut down. Egregious or repeat offenses will result in the confiscation or disabling of the effect. For larger Flame Effects a safety perimeter and clearance from other art or flammables may be needed. Please see the guidelines for Safety Perimeters for info on these. Safety Team Member will notify staff FAST by radio or nearest Ranger and remain in communication with them until able to direct them to the affected area. Operator or FAST member will activate shut off valve(s) if accessible and utilise fire extinguisher to extinguish or control fire. Operator will notify on-site FIRE SAFETY (EMS) by radio and notify Rangers to assist in evacuation. FAST members will evacuate audience in an orderly manner and extend the perimeter to a safe distance based upon any possible containment vessel failure. Safety and Operator team will attempt to control fire utilising fire extinguishers until such time as the Fire Safety Crew arrives. Operator may suggest that FAST allow fuel load to combust unless water may be applied to cool the appliance enough to allow access to shut off valve(s) with proper safety clothing and gloves. Continued monitoring of the device will be observed until the entire device is cool to the touch and checked for damage. Device will be taken out of service and disconnected from fuel sources until it may be re-certified by Event and Tankwa Fire services. Closest Operator or FAST member will activate shut off valve(s) and utilise ABC Fire Extinguisher to immediately extinguish the fire. Safety Team Member will notify Fire Safety by Radio or nearest Ranger and remain in communication until their arrival. Notify on-site EMS by Radio and notify Rangers. Ask Rangers to call FAST Lead. Evacuate audience in an orderly manner and extend the safety perimeter to a safe distance based upon any possible containment vessels failure (BLEVE) if fire is not immediately extinguished. Continued monitoring of the device will be observed until the entire device is cool to the touch and maybe checked for damage. Device will be taken out of service and disconnected from fuel sources until it may be recertified by Event and Fire Authorities. Activate shut off valve(s) and discontinue effect. Notify on-site EMS by Radio. Apply appropriate first aid to stabilise victim. Clear area to allow on-site EMS access to injured party. Arrange transport of victim to nearest hospital if on-site EMS does not provide an ambulance. Notify EMS if deemed necessary. Apply appropriate first aid and take victim to closest event First Aid Station. Monitor victim for signs of shock after initial treatment. Those providing transport of fuel should read these fuel delivery and transport guidelines. Fuel must be stored in appropriate containers, which include 200L fuel drums and approved 20L containers. Fuel containers shall not be overfilled. FYI: most fuel containers are designed to be filled to 80% in order to allow expansion based on temperature change. Proper seal must be ensured on all lids, caps, bungs, or valves to prevent spills or leaks. All containers shall be securable to prevent tampering. Fuel must not be stored in close proximity to any sources of artificially produced heat that could cause the fuel to combust or ignite. A distance of 3m or greater must be maintained from the fuel storage and tents, equipment, public areas, Caravans, RVs and all camp structures. A fire lane of 6m shall be free of obstructions to provide emergency access for fire vehicles if needed. No fuel storage area shall be closer than 30m from another fuel storage area. All fuel storage areas must be protected from vehicle collision. A safety area of 3m around the stored fuel should be marked as off limits using caution tape or other equivalent measures. Extinguishers rated as ABC, AB, or B will have a separate value for the B rating, this number should be at least 40; which indicates the square footage (12 square meters) of a class-B fire it is designed to be used on. The fire extinguisher must be placed 2.5m – 3m from the fuel storage area and be easily visible. Note: Proper signage of “NO SMOKING-FLAMMABLE” must be clearly visible. Never fill the tank on a generator that is running. When transferring fuel, use a pump. Never try to start a siphon using your mouth – a mouthful of gas or diesel could be fatal to you. For health reasons, wash your hands after fueling. Keep all equipment used for fuel storage and handling in good condition – and watch for leaks, deterioration, or damage. If fuel is spilled on your clothing, move away from any ignition source, and allow the clothing to dry. Use waterless soap for hands. If fuel should splash in eyes, use water to flush. Be aware of static electricity that can build up on you and or a container. Any spark can ignite petrol vapors. Always fill containers on the ground, not in vehicles. You deserve a medal – a fire safety diligence medal! Thank you for taking the time to absorb all of this info – as you can see, it’s all based on common sense and is underscored by the need to keep Artists, crew and participants safe, alive and well.